As Komandoo guests, you have a once-in-a-lifetime opportunity to dine below the ocean and send your senses soaring at 5.8 Undersea Restaurant, which is just a few minutes away from Komandoo at our sister resort, Hurawalhi. An extraordinary dining experience, 5.8 metres below the surface. Treat yourself to a lunch or sunset dinner at Hurawalhi’s iconic fine dining restaurant that serves a combination of gracious location and inventive dishes. With a wealth of experience from a number of exceptional establishments, Warren Moore is the driving force behind the fabulous cuisine of 5.8 Undersea Restaurant. 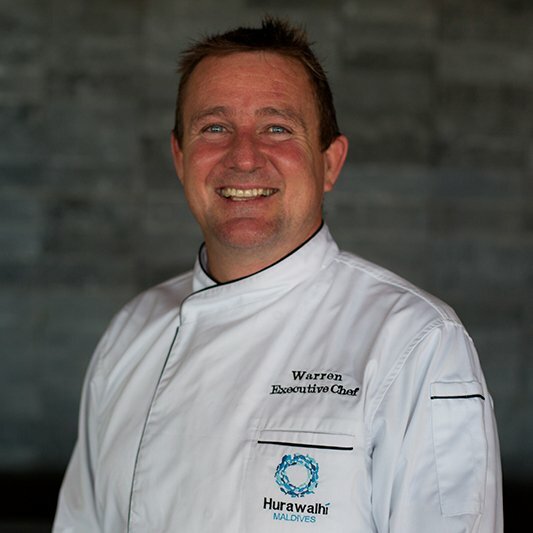 Bringing inspiration from his time working in the USA, Europe and across southern Africa, Warren delivers imaginative, diverse and high-quality dishes and dining experiences that are bound to impress any palate. Poached Canadian Lobster with Smoked Trout Beet Ravioli, Cucumber Yuzu & Galangal Foam with Truffle Caviar. Seared Wagyu Tenderloin with Wagyu Cheek Confit Truffle Almandine Herbed Pommes. Mango Cheesecake Cocoa Cracker Soil, Mango Ganache and Honeycomb Tuile. Menus can vary based on season and chef’s current culinary inspiration. Whether it is an ethereal bottle of champagne, luscious, crisp white wines, full-bodied reds or refreshing rosés, we are certain that you will find exactly what you are looking for. If you require guidance on which vintage to select our wine sommelier is available at your convenience. The incredible dining experience at 5.8 Undersea Restaurant can be booked either at Komandoo or through our gift store. Due to the limited seating capacity, we recommend that guests who wish to guarantee a table book online in advance. Komandoo’s gift platform allows you to book either for yourself or to gift the experience to a loved one to enjoy during their stay at the resort. What’s the dress code in 5.8? Is it a barefoot venue? Dress code in 5.8 Undersea Restaurant is smart casual. The restaurant is a barefoot venue and all guests are required to take off their footwear at the entrance of the restaurant. 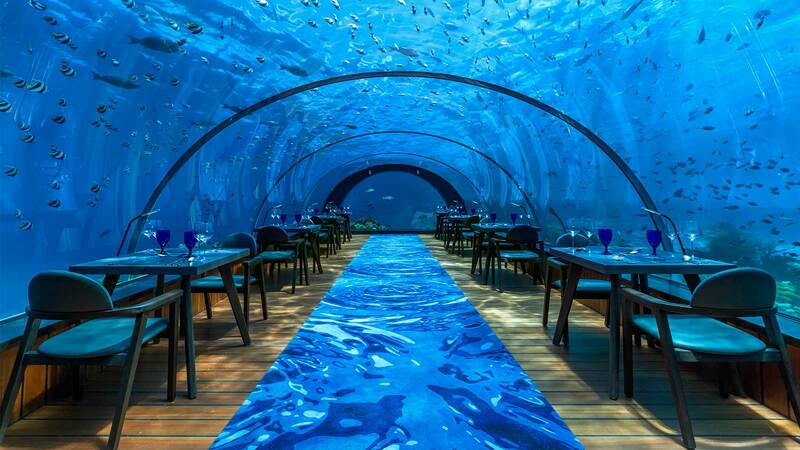 Is it possible to visit 5.8 Undersea Restaurant just for a look (not to dine)? 5.8 Undersea Restaurant accepts bookings for lunch and dinner. Due to the intimate environment offered by 5.8, only guests with a reservation are able to see the restaurant. Is 5.8 Undersea Restaurant able to accommodate dietary requirements or preferences? A variety of dietary requirements can be accommodated at the restaurant. Please communicate any restrictions or preferences when making the booking. Is dining at 5.8 Undersea Restaurant included in Komandoo’s all-inclusive packages? 5.8 Undersea Restaurant is located at Komandoo’s sister island, Hurawalhi. Dining at the restaurant is not included in any of Komandoo’s meal plans. Sign up to our newsletter to receive special offers and latest news from the resort.